BMW only lifted the wraps off the new 8 Series Convertible last week. Just last week, . Now, four months after the , the first example has already rolled off the production line at BMW’s factory in Dingolfing, Germany, where around 1,600 cars are produced every day from the BMW 3, 4, 5, 6, 7 and 8 Series ranges. The BMW 8 Series Convertible will be built alongside the BMW 5 Series and 7 Series on a single assembly line. It features a fully-electric soft-top roof that takes 15 seconds to raise or lower at speeds up to 30 mph. 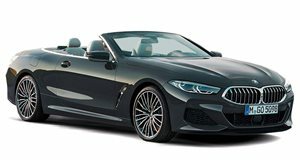 The 8 Series Coupe and Convertible models being assembled in BMW's provided photos are the 840d variants equipped with an inline-six turbodiesel engine. Convertible models often look worse than their hard-top counterparts, but the 8 Series Coupe and Convertible both look stunning side-by-side. In the 840d, the 3.0-liter diesel unit sends 320 horsepower and 502 lb-ft of torque mated to BMW’s xDrive all-wheel-drive system through an eight-speed Steptronic gearbox. US customers will get the M850i xDrive variant, which is powered by an upgraded twin-turbo 4.4-liter V8. The V8 unit delivers 530 hp and 553 lb-ft to all four wheels via an eight-speed automatic. The Dingolfing facility is one of BMW’s 30 global production sites. Last year, 376,000 cars rolled off the assembly lines at the plant. To prepare the factory for the new 8 Series, BMW had to invest a “total amount in the low three-digit-million-euro range.” A “large number of digital innovations” were also integrated into the production process, including self-driving transport systems and smart devices.